"SALSA DEL SALTO is the realization of our dream" explained French Chef and renowned ski instructor Dadou Mayer and his wife Mary Hockett a native New Mexican. 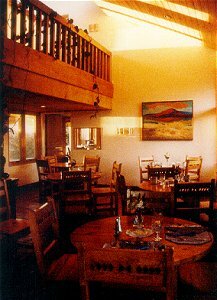 "We had a vision of creating a place where visitors could stay in luxury while experiencing the Taos we love". Their contemporary Southwestern home does just that. Soft leather couches and oversized chairs are grouped around the massive two story fireplace in the living room, while the sunny dining room has a more rustic country feel. Their ten guest rooms have king or queen size beds some with fireplaces and jetted tubs all in southwestern colors and textures. 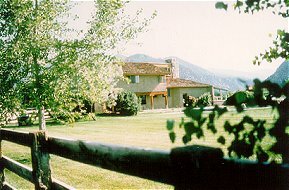 Guests play tennis, enjoy a relaxing swim or soak in the hot tub; while taking in stunning mountain views. Taos Ski Valley is an easy ten mile drive. Guests awake each morning to a new culinary adventure; some which have been featured in Gourmet Magazine. Bon Apetit!